My grandfather’s cousin’s have been making bells for 1000 years in the oldest continuous family business in Europe. Barely changed since, you can watch the artists at work, as Ivo carefully describes the 3-month process. Molise is still pretty undiscovered. Seeing the ancient Samnite ruins of Pietrabbondante is a profound experience – there are no tourists! Walter will explain the history and significance of this pre-roman tribe and the part it played in empire building. Copper was the mainstay of the economy, with Italy’s best coppersmiths hand finishing work from 5 foundries. The tradition survives today, and you can hear Franco tell the story in Italian with great passion and pride. Venetian craftsmen came to create the palazzos and churches of the centro storico; every corner and piazza has a story. Family businesses have lasted generations and are constantly innovating to survive today’s challenges. We meet with the younger generation to discuss their reasons for choosing to stay close to home. 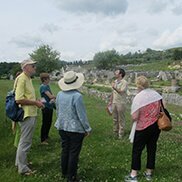 Outlying villages, the larger towns of Isernia and Campobasso, and the environs of Agnone itself afford us ample opportunity to mix and engage with a vibrant community - passionate and knowledgeable about their history and traditions.